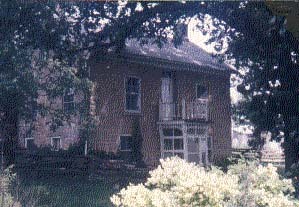 The house, also known as the Blodgett House, was built in 1854 by Henry Milder. He was one of the first settlers in the town of Vernon Springs on the Turkey River in the Northeastern part of the territory that would later become the state of Iowa. He is also thought to have built the "Blue Store", but it is not known whether this was a separate building, or if our house was, in fact, also the Blue Store. 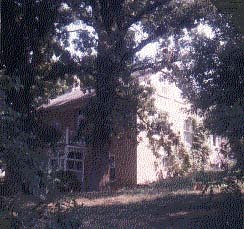 The first county court sessions took place in the house, before the first Howard county court house was built. And it seems that the first wedding took place in our house, because of this. Or perhaps because Henry Milder, who seems to have gotten married about this time, was in this first wedding. The town of Vernon Springs, along with its downstream twin, New Oregon, prospered along the Turkey River until the coming of the railroad in the 1860's. The railroad builders chose a route 2 miles north of Vernon Springs, and the town of Cresco was accordingly founded along its route. With that, the towns of Vernon Springs and New Oregon faded away, although their existence is still obvious in the concentration of homes that are still to be found along the scenic banks of the Turkey River. Our house was repeatedly abandoned and reclaimed throughout the years, and by the time my father bought the property in 1970, it had been used as a hayloft, and grain bin, as well as for the parties of local young people. As a result, its windows were kicked out, its wiring was pulled down, and the structure was in danger of being burned down at the next drunken party. The house was so dilapidated, that it was not even considered in the price of the property when my father bought the three lots in the new subdivision in Vernon Springs. Dad worked very hard to fix up the house, using salvaged period materials and furnishing the house with auction finds (an exercise born of necessity that has continued now long after the necessity has passed). Even so, when he and my mother got married in 1971, the plumbing wasn't in, and Mom endured morning sickness with me in the outhouse. 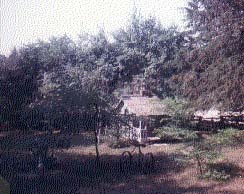 In the early 80's, we added onto the back of the house, doubling the living space, but even so, my sister and I shared a small bedroom until I went to college. The addition, intended to be usable as a separate apartment/house for grandmother, instead has been used to hold Dad's better auction finds. Mom gave up even worrying about cleaning the stuff years ago, and my sister and I can't keep up with the new finds. The house and its furnishings have not been the only projects of my father. He's also expended considerable time and effort, if not money, in the landscaping of the 4.5 acre surroundings. It's quite amazing to compare early photos of the lonely old house on the hill, with the thick green park that now surrounds it. It was a great place to grow up, and its a perfect place to go home to now - to stop and smell the roses (and the lilacs, and the peonies), and remind oneself anew of the joy of a simple life and the rewards of patient labor - no six-figure salary required.